Even more, I got on buses that went from city to town in NW Arkansas to hand out literature for WR and Footsie and, later, Sterling. I was a page at the 1968 Republican National Convention and started the Campus Action for Nixon (Nixon CAN!) at the UA in 1968. I was elected state treasurer of the Young Republicans and could have been state president. 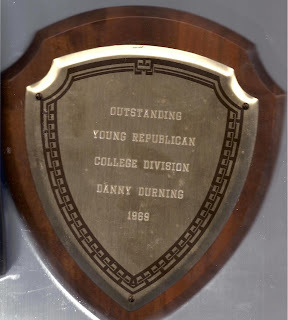 I even won an award as the "Outstanding Young Republican" (college division) in 1969. OK. I. Admit. It. During the 1970 [Young Republican] convention, while the leaders were at each others' throats, the delegates, dominated by college-age kids, passed a platform which shocked the senior party. It called for decriminalization of marijuana, liberalized abortion, legalized gambling, removal of all censorship laws, and repeal of laws relating to sexual activities between consenting adults. The Young Republicans had taken on a libertarian face, and not everyone was happy about it. I was one of the "college-age kids" that helped get this platform passed. A few weeks later, we were all, in effect, kicked out of the Young Republicans and the people with more traditional views took control. Just a few years later, WR died and the special nature of the Republican Party in Arkansas ended. But what the heck, who am I kidding, it was all great fun while it lasted. Invigorating "Youth Days" at WR's Petit Jean farm (Bob Hope was there once). Telegrams from WR thanking me for this and that. Invitations to the inaugurations. A free week in Miami to attend the Republican National Convention (driving WR through Miami in a brand new Cadillac; front row seat at the Fontainebleu floor show courtesy of WR's credit card; staying at Joe Garagiola's hotel and meeting him). Attending a Republican Governor's Conference in Hot Springs, meeting VP Agnew, Gov. Reagan, and a host of other Republican governors. Flown from Fayetteville on a private airplane to East Arkansas for a supper with Charles Bernard, who was thinking about running for some office. Bussed to Fort Smith to hear Speaker of the House Gerald Ford one year, Nixon-in-exile the next. Exciting times for a college kid. And the annual Young Republican conventions were a charge of adrenalin. We were all so serious trying to get elected to this office or that one; trying to get our resolutions passed; trying to stop the Harding College YRs from passing their nutty resolutions. Late nights bargaining, cajoling, arguing. Running from room to room to meet with delegations from different colleges and counties. Quiet midnight deals that might unwind as the deal makers met with others and made other deals. Early morning get-togethers for final desperate efforts to win over that person or that delegation needed to win the office or pass the resolution. Friends, allies, enemies, opponents: changing by the hour. Tense votes; jubilation or despair. All compressed into a couple of days. Yelp, lots of fun and pretty much meaningless. Anyway, I was reminded of all the pleasures of YR benefits and the passion of playing Young Republican politics during the Rockefeller years when I re-read an article that I wrote in 1975 for the Arkansas Advocate, an independent monthly newspaper published in Little Rock during much of the 1970s. The article's title was "The Political Bush Leagues: The Young Republicans." I wrote it a few years after I left the YRs, and exited electoral politics all together, to do other stuff required to make a living. Reading the 1975 article brought back names and memories of feuds long forgotten. Sometimes it helps to have a good sense of the absurd when you revisit your past. Then you can enjoy the follies as well as the triumphs.